Meg and I were craving something sweet after our Studio Square meat and beer fest. So where did we, two faithful chocaholics go to satisfy that hunger? Cafe Bar answered our call with their chocolatey rich desserts and flavorful coffee drinks. I usually don't get my own dessert, preferring to split it but why go dutch when we were already indulging? 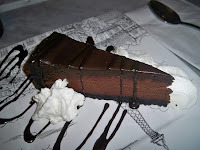 Mississippi Mud Pie - You can't go more chocolatey than this--a thick, cheesecake-like middle of semi-sweet chocolate, topped with dark chocolate ganache. The base had a crumbly, oreo cookie-like consistency, which just put it over the top on the indulgence scale. While it was unbelievably rich, it went down way too easily, especially when coupled with a good decaf cappuccino. I'd recommend sharing this dessert but know that you can finish it on your own if you're so inclined. 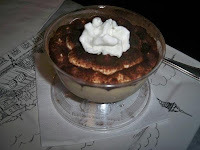 Tiramisu - Meg chose a classic tiramisu cup, that was presented with gorgeous little layers of cocoa-dusted mascarpone cheese. Despite its richness, I just loved how wonderfully light it was both in your mouth and in your stomach--it resembled and tasted like a fluffy cloud. I liked that there wasn't much alcohol (if any) in it--I detest when restaurants drench tiramisu with liquor, it's uncalled for. Overall, I'd strongly suggest checking out Cafe Bar for a light snack, dessert, tasty coffee drinks or even cocktails. It's an all around goody--and the funky art-deco furnishings work to create an atmosphere of comfort and harmony. The brunch menu looks really unique as well. Omelette with tabouli? Cool Middle Eastern twist. Yeah, they're pretty inventive - I love the overall vibe.